Tim McGraw just released “Neon Church,” his first solo single in two years, and it’s already top 25 on the Country chart. 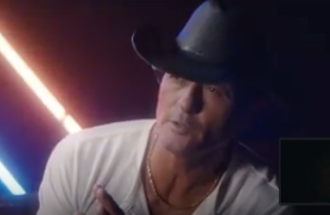 “Neon Church” combines powerful lyrics with McGraw’s trademark emotional vocals, a winning combo that’s earned him 25 number one singles! There are acres of Country oldies about barrooms and broken hearts, but something about McGraw’s “Neon Church” reminds us of the late Gary Stewart, dubbed “King of the Honky-Tonk,” and his now classic “She’s Acting Single, I’m Drinking Doubles,” which hit #1 in 1975. TV alert! Tonight at 8P ET on ABC, Brad Paisley and Carrie Underwood host the Country Music Awards for the 11th consecutive year.